Palíndromo’s services are provided within the framework of a Management System that complies with the requirements of various international standards. The company’s Management Principles and Quality Policy, which establish the basic criteria on which the provision of the service is based, are available to interested parties who wish to consult them. 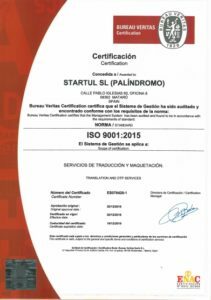 Standard UNE-EN ISO 9001:2015, ‘Quality management systems. Requirements’, establishes the minimum requirements to ensure adequate management of the quality of an organisation. 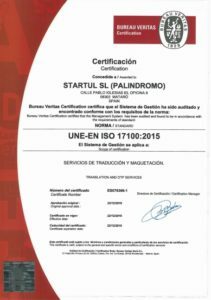 Standard UNE-EN ISO 17100:2015, ‘Translation services. Requirements for translation services’, introduces additional requirements applicable to companies in the sector. The Management System is certified by an independent certification body.